Hello all. We are still here. It’s been five days since our last post. So, here is the update. 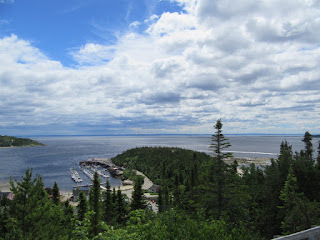 We spent two more days in Tadoussac. Fran and I did hikes each day. The scenery here is breathtakingly beautiful reminding us of our visit to Alaska a couple of years ago. We enjoyed more meals at restaurants in the village. 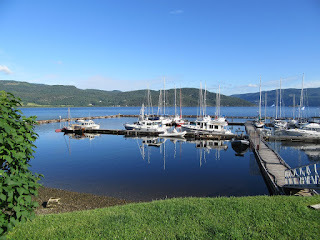 We were all set to leave on Monday to head up the Saguenay fiord, but a free night at the marina, combined with a forecast for late day 25-35 knot winds and a severe thunderstorm watch had us stay one more day. While most of the day was beautiful sunshine and light wind, the forecast was dead accurate with high winds, heavy rain and a thunder storm around 1700 hours, lasting for about one hour. 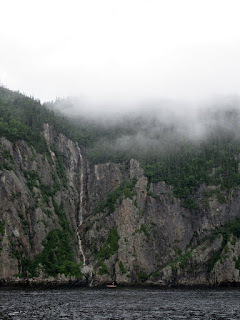 So, on Tuesday July 5th, with some cloud and a little fog, we departed the marina on a flood tide and headed up the Saguenay. The fiord is about 68 nautical miles long and between 1.2 and 2.5 miles wide. The average depth is 690 feet and we regularly saw depths of well over 800 feet. Inside the fiord, the top 7% of the water is fresh and the lower 93% is salt water. The fiord is precambrian. About 200 million years ago, a rock basal complex between a north fault and a south fault collapsed. Later, during the last glacial period, a 1.5 mile deep ice sheet cut the fiord and caused the region to sink, thus creating the Saguenay fiord. The cliffs / mountains on each side reach almost 1,000 feet. We’d read that a wide range of whale species travel the first five miles of the fiord and the belugas go all the way to Chicoutimi near the end of the fiord. One cove on the north shore is off limits to boats as it has been designated a sanctuary for belugas. Armed with this information, we were expecting to be seeing whales everywhere we looked. 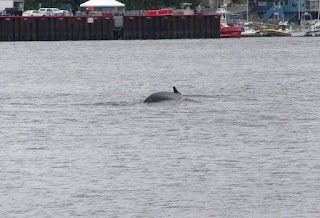 It was quite a surprise when we got 20 miles upstream and hadn't seen one whale. Thankfully the wonderful scenery make up for no whale sightings. 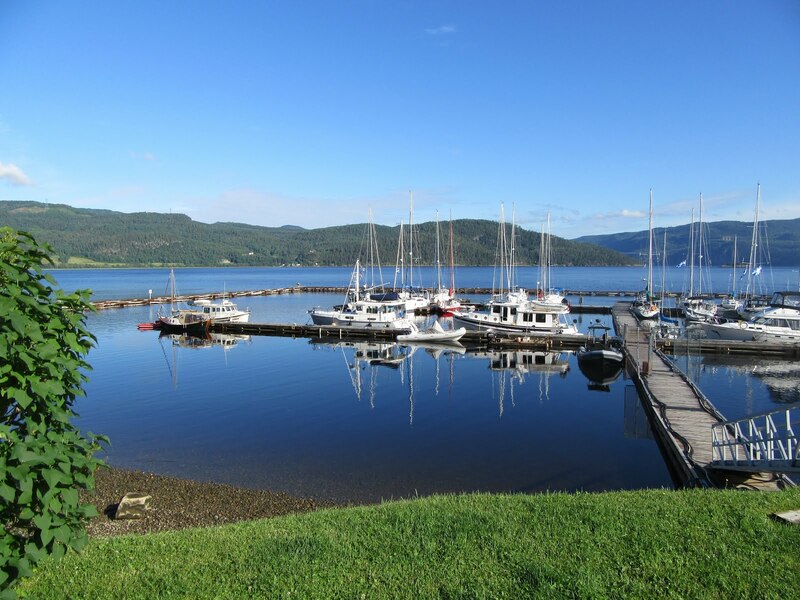 One of our objectives for visiting the Saguenay was to try anchoring in tidal waters. In this area, the tidal range (difference between high and low tide) at this time in the lunar cycle was a substantial 20 feet. The other challenge here is how quickly the water level drops from say 20 feet to over 100 feet. On our way up the fiord, we checked out two possible anchorages and decided the water was too deep for successful anchoring. At the village of Anse-Saint-Jean, we took a preliminary look at the anchorage, but quickly concluded it was safer to try anchoring there during low tide when we could properly assess the shoreline when the water level would be lowest. We spent a lovely evening at the village marina where we found extremely helpful staff and boaters. The marina manager was actually born in neighbouring Burlington, Ontario. He attended a friend’s wedding in the village 15 years ago, got a job during his visit and stayed. Late the next morning at low tide, we decided to try anchoring again. We found what we thought was a reasonably flat area in 25’ of water. Adding 20 feet for tide, we’d need to let out about 225’ of rode for safety (5:1 ratio of maximum water depth to length of anchor rode). We started out with 175 feet, but the stern of our boat got into 6’ of water before our anchor was properly hooked. 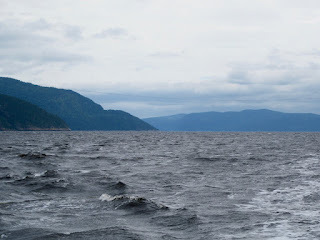 The wind and waves were picking up and we concluded anchoring in the Saguenay was probably not a great idea. Plan B was to head a further 8 miles up the fiord to tour Baie Eternite. Two Cap’s (capes) stand guard, one on each side of the large bay (Cap Eternite and Cap Trinite). Cap Trinity has three steps. The first is 122 meters high and it has a 9.75 meter tall statue of the Virgin Mary perched on it. This statue was rough hewn from wood and then coated with lead and hoisted into its present position in 1881. The second step is another 90 meters higher and it has a large cross on it. The third step is 457 meters above seal level and it reportedly offers a commanding view of the fiord. The story of this statue of the Virgin Mary begins with a man named Charles Robitaille, a salesman who traveled the roads around Quebec. During winters, he would even cross frozen rivers. In the winter of 1878, while trying to cross the Saguenay River, the ice broke under the weight of his horse and sleigh. Charles was pulled beneath the ice, alone and helpless, and knowing he was dying, he implored the Virgin Mary to save him. He miraculously survived and managed to escape the icy river waters knowing it was the Virgin Mary who assisted him. 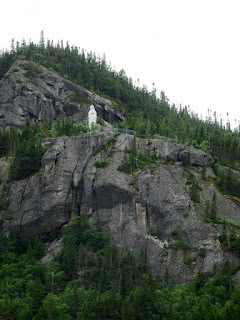 To honour her, he asked sculptor Louis Jobin to create a huge statue of the Blessed Virgin in the image of Our Lady of Lourdes. The finished statue is 35 feet high and weighs three tons. It was carved from solid white pine and sheathed in lead to protect the statue from the weather. After construction, it was broken down into 14 pieces and hoisted into place and re-assembled on her perch overlooking the Saguenay fiord. She is a regional landmark attracting visitors from all around the world. 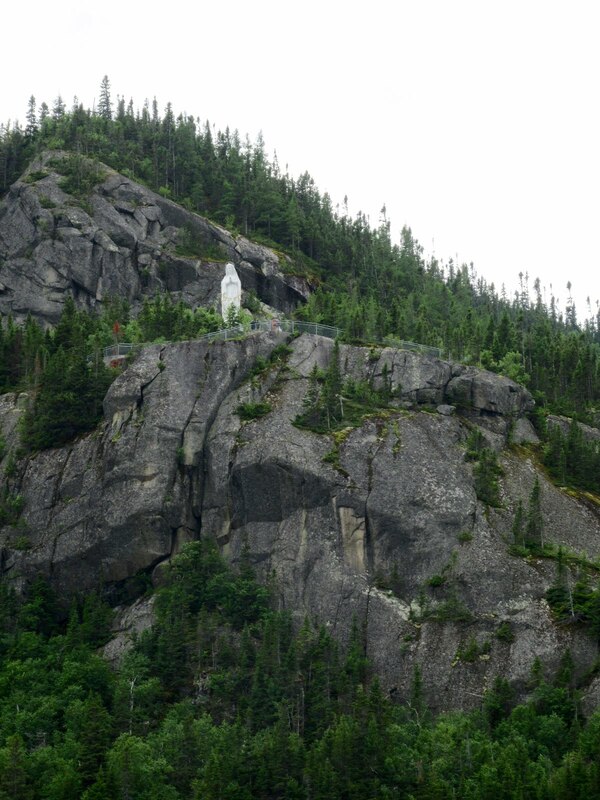 The statue became known as Notre-Dame due Saguenay. 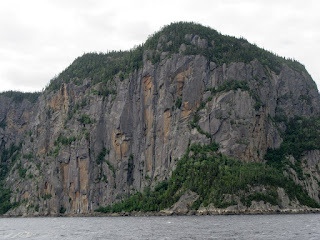 The spectacular cliffs surrounding Baie Eternity were a wonderful treat to see and try taking photos of. 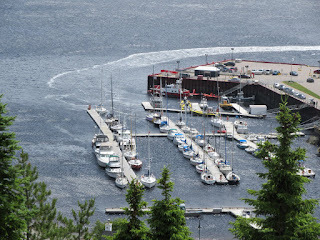 The water in the bay is far too deep to anchor here, so Parcs Quebec installed mooring balls for boaters to tie up to. Originally there were 20 mooring balls and boats tended to raft together on the mooring balls, but then the weight of multiple boats on an outgoing tide would drag the weight holding the mooring ball into deeper water and it would be lost. Now, only two mooring balls remain. 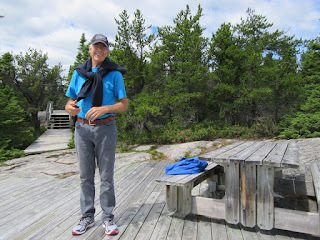 When we visited one was already taken, so after our tour we returned to Anse-Saint-Jean for another night. I learned a local Petro Canada gas station sold propane and one of our tanks was getting low. The marina manager offered one of the bicycles for me to use and advised the station was about a 15 minute ride away. I tied the 10 pound tank to the bicycle carrier and set off with my map to find the station. Tired and out of breath, I arrived at the Petro Canada station 45 minutes later. The price was great and 15 minutes later, with a heavier tank tied on the carrier I was off peddling the bicycle again for the return trip to the marina. It was a 21 speed bike, and I think I made use of most of them, negotiating the ups and downs of the route. As recommended, I took the scenic route back which included crossing a lovely covered bridge. When I returned triumphant with my full propane tank, I joined Fran, Bob and Jan for happy hour and savoured my Scotch and water with great satisfaction and very tired legs. Our friends Dave and Judy are still in Quebec City. Dave and the dinghy dealer worked out a repair solution for his dinghy hull to see them through this summer. However, Dave had to do the work as the dealer was not prepared to accept the liability of repairing the injection moulded hull (based on guidance from the manufacturer). Dave was allowed to use the dealer shop and materials to fabricate several stainless steel plates together with backing plates that he bolted in place with MMM5200 sealant to render the hull stronger and water tight again. This took about three days and when the job neared completion, they then found themselves in gale force north east winds, unable to depart Quebec City for a few more days. Grrrrrrr. On Thursday July 7th, we decided to return to Tadoussac to be in a position to cross the St. Lawrence to Rimouski when the winds allowed for it. Under cloudy skies and light drizzle, together with some fog, we headed back down the Saguenay fiord, once again keeping our eyes open for whales. This time we were rewarded with sightings of a group of belugas en route and a single minke whale very close to Tadoussac. We’d timed our trip to arrive in Tadoussac near low tide so once again we could try anchoring in tidal water. Earlier we’d watched numerous sailboats anchor in the bay and decided we were comfortable with that location. After three tries, being sure we were well hooked, had enough anchor rode out and would not be too close to shore, we declared ourselves successfully anchored. Our friends on Wings tried a few times but could not get successfully hooked to their satisfaction. At one point their boat touched a rock on the bottom and in the end they decided to return to the marina. We ended up anchored a little further around the bay than we’d planned and the waves were causing us to roll side to side a little more than we’d have liked. However, this was offset by the realization we were in a good spot for whale watching. As I type this blog post, I’m looking up every 30 seconds to scan the water. A minke whale has been hanging about roughly 400 yards away from our boat for hours. At one point, the whale headed directly towards our boat. As we held our breath and waited for him to resurface, Fran heard this loud blow (whoosh) as he passed close to our boat. 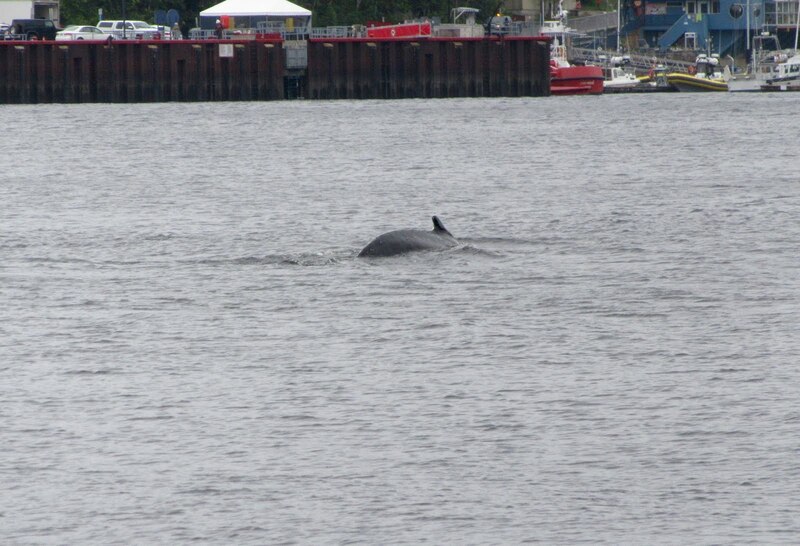 Our camera and our photography skills are not great, but we did manage to get one shot of the minke. What a wonderful treat. You just never know what this cruising adventure is going to present.